Characteristic of periodically flooded ground, including forests and edges of wet prairies; often planted and easily grown on upland sites. Besides the very small and distinctive acorns, the small, acute, nearly glabrous winter buds will usually serve to distinguish this species from Q. ellipsoidalis. The leaves of Q. palustris are said to be usually recognizable by a combination of cuneate base of the blade (decurrent on the petiole) and conspicuous tufts of pubescence remaining until late in the season in the axils of the main veins and often along the midrib beneath. Our specimens, however, often have quite truncate leaf bases, but they do have prominent axillary tufts of pubescence (if not more along the midrib). The habit of pin oak is so distinctive that it can be recognized in winter from a long distance. 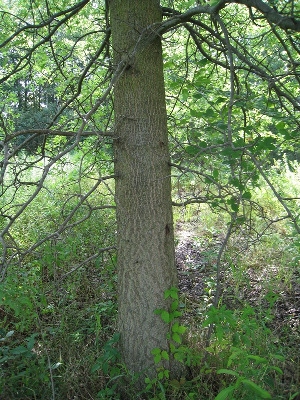 The trunk is very thick relative to the branches; the lowest branches are persistent and sweep downward. MICHIGAN FLORA ONLINE. A. A. Reznicek, E. G. Voss, & B. S. Walters. February 2011. University of Michigan. Web. April 25, 2019. https://michiganflora.net/species.aspx?id=1381.